Revisiting Value Immersion: Where are your hot spots? 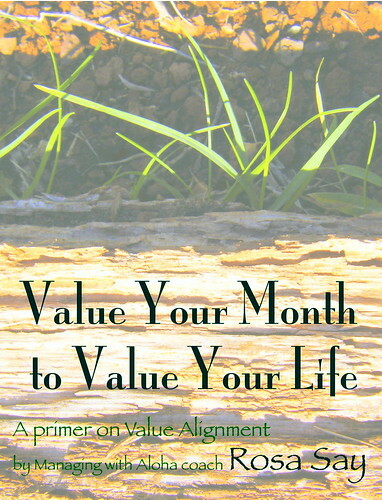 Immersion has recently taken center stage in our Managing with Aloha vocabulary and Language of Intention by way of our value alignment conversations here on Talking Story, which in turn led to my newest ebook: Value your Month to Value your Life. So as you can imagine, the concept of Consumer Immersion leapt off the pages of a book I’ve recently read by Ron Rentel (with Joe Zellnik) called Karma Queens, Geek Gods & Innerpreneurs. The book’s subtitle is “Meet the 9 Consumer Types Shaping Today’s Marketplace” and if that intrigues you, I’ll be posting a full book review before the week is over. The most effective ‘Value Your Month to Value Your Life’ programs I’ve seen in workplaces, succeed because they go for value immersion. For example, if Kuleana is the value for the month, they look at everything happening during that month through the lens of Kuleana-colored glasses, with the intention of tweaking processes for more value alignment. People put their hand up to work on what comes up. Bosses give the green light to stretch inter-departmentally, encouraging those conversations, and knowing a welcome mat will be in place because the value has been adopted everywhere, even if temporarily. “Everything happening” means you’re nalu-ing it: You’re going with the flow as events and activities naturally happen because of past habit or current developments, and what you’re “tweaking” is largely your responses to all those things inclusively. As you do so, you tackle everything that Kuleana affects (returning to our example) as the value of responsibility and accountability. For instance Kuleana is a tremendous help as criteria, filter, and priority-sorter when selected during times of company change, because responsibility is very much like motivation: it’s personal and self-driven. What Value Immersion tackles best is apathy and complacency, for it uncovers the three workplace sins of auto-pilot, lies of omission, and tacit approval. Our view of Value Immersion is that the best place to investigate workplace culture is to speak to business partners (i.e. our preferred name for ‘employees’) where they work, to follow them as they go through daily job tasks and business initiatives, and to interact with them in a variety of their sense of place real-work settings. Metaphorically speaking, where in your operation are the ‘kitchen tables’ and ‘juice bars’ where more Aloha-based values can deliciously, and nutritiously be served? The art of managing well is a situational art in so many ways. We seek to catch people doing something right so we can applaud it, appreciate it, and yes, clone and strengthen it. We want to reward the behavior we that we want to have more of, and with value-mapping we are becoming more specific: We are appreciating and celebrating value-aligned behavior. But so much rides on seizing those opportunities where we “catch people doing something right,” doesn’t it. Wishing and hoping is not a reliable strategy, for all it delivers is happenstance. So think of your value immersion design — that simple, yet strategic decision to have a Value of the Month in your workplace as the way you start — as deliberately creating the hot spot you will benefit from. Create your fertile ground of ‘kitchen tables’ and ‘juice bars’ by choosing your values. You have to take that first step. The easiest way? Grab the ebook. Just 18 pages as a printable PDF you can openly share with your team. Read it together, so everyone is literally on the same page. Having regularly scheduled staff meetings has become a no-no, something we avoid like the plague in workplaces. Why? Boycotting staff meetings is absurd. Meetings are not a problem dear manager; bad meetings are. And make no mistake; you need them. The solution is simple: Have good meetings! Before we jump to any how-to (something you can probably figure out on your own anyway) let’s talk story today about why you should have them. A feature I’ve loved with using Google Calendar is that you can have several calendars, each for their own specific purpose, merged together on one weekly view in a pleasing color-coded rainbow of productivity. Very useful. One of my favorites has been a ‘green light’ calendar I call “Personal Intersection.” I’ve used it for logging the recurring staff meetings of my Say Leadership Coaching customers, and workplaces I’m aware of which actively use and practice Managing with Aloha. These are the people of the “in real life” Aloha and Ho‘ohana movements I want to actively support as much as is personally possible for me — and here’s the key, when it’s also rhythmically useful for them. This is how I use it: When I’m in town (which in Hawai‘i often translates to “on their island”) and happen to have a morning or afternoon block free, I check who might have a staff meeting then, pick up the phone and ask to be invited, asking if I can stop by and sit in to support them, or if they like, to give a short 10-minute whiteboard lesson on whatever MWA value-alignment they wish to revisit. I do this for free. They don’t have to ask, because I offer, knowing that I will love being there with them in their working with Aloha laboratory. It’s been a great way to optimize my travel schedule. Now I have terrific customers. Because they embody Aloha they always welcome my visits and do whatever they can to get their team together. But I tend to call them less often than before if I feel I’m intruding, precisely because I don’t want them going out of their way for me. I want to intersect and blend in, not interrupt and disrupt. People are so polite, and they don’t say no, even when they should. And I certainly don’t want to call attention to something which is now glaringly missing for you. Okay, maybe I do, but I’m writing this to be more proactive than reactionary about it! Those recurrences, where everyone in an organization knows that you meet for a sacred hour or so every week are human touchpoints; they are huddles which add invaluable ‘social currency’ to the emotional bank account of workplace teams. If you honor that as the ‘Why?’ you have meetings, how you have them, and what they’re about will follow, form for function. People will not dread attending each week if your staff meetings become a time they go to the well and recharge, because you’ve made them a source of energy, inspiration, and their opportunity to connect on a regular basis without having to schedule something special. Bring back your staff meetings, and make them interesting and useful. I’m purposely excluding the word ‘creative’ here too: Creative approaches to meeting reinvention can totally miss the mark, because we get distracted and off-point with silly surface fixes that are cosmetic and meaningless. You know what I mean: ‘manufactured play’ can insult the value people place on the time they give you by merit of their attention. I get that recessionary times have caused you to look for efficiencies, I really do. But consider the price of omission. And by all means, say “No, can we try again next time?” to visitors like me when you need to own your agendas, or if my version of ‘given for free’ will actually cost you in some way. So huddle up: Bring back your staff meetings and have them be a place your people plug in and get charged up. You cannot sacrifice getting your team together on a regular basis to converse and collaborate in person socially, and without added production: Staff meetings are part of that intangible worth within Sense of Workplace belonging. Update: My stats tell me that someone has been coming back to this post due to a search for “rules of engagement.” So Arlington, Virginia, this is for you, just in case you happen to return: What you’re looking for might be found here: The Real Rules of Engagement at my Tumblr. How much junk is costing you money, and worse, cluttering up those spaces where good work, important and creative work, should be getting done instead? True legacy isn’t in your physical stuff. Within the work I do I have the opportunity to visit a lot of different workplaces. I’m getting braver about pulling out my camera and asking permission to take photos, and not to publish them, but because my photos help me remember details about my visits with you: It’s quicker digital note-taking. Weeks after a visit, I can look at the photos again and they give me different impressions: I see things I missed the first time around because I wasn’t looking for them. On a recent romp through my iPhoto albums, this is what I saw: A LOT of office junk. On the other hand, I rarely see comfortable PLUS useful places for people to sit, and work together. In most cases, we don’t bring our team members home with us! (to work… more about that in a moment). Have you stopped to consider just how much your office or workshop junk gets in your way these days, or takes up space? Can you imagine how much collaborative, synergistic huddle space you could open up if you got rid of it? We managers need to give our people the room they need to work clean, to make creative messes, and to work co-operatively as they do so. Both of these aren’t used as much anymore (or shouldn’t be) as we’ve gone digital: We simply print and keep way less paper than before. How many of you have a filing cabinet drawer in your office that has never, ever had a hanging file folder in it because it’s filled with snacks for break time? And these two are just small, common examples —at least that filing cabinet is used for something. I see tool belts collecting grime in workshop rafters because mechanics are now working with computer chips, and conference rooms with too-small tables and too-few chairs because a healthy chunk of the room is “dressed up” with overhead projectors, clunky chalkboards on rollers, or given to storage space (for more junk). How much are you paying to continually straighten, dust, and clean around all that stuff? 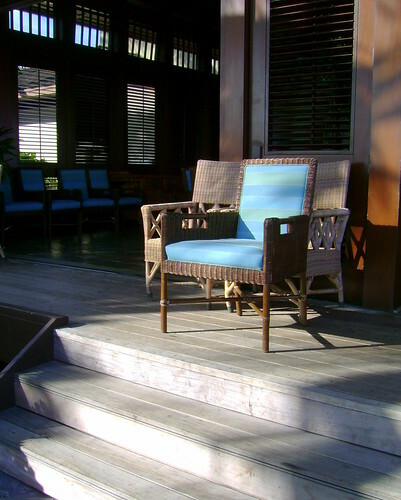 Worse, how much are you still using it, because it’s “still too good to throw away.” The problem with your frugality and pack-rat habits, is that you allow the old process connected to that junk to proliferate, keeping you archaic in your thinking as well. Think old, act old, produce old. On the other hand, leading encourages making your newness. Those people you call your “greatest asset” huddle in corridors or alleys to exchange their ideas, or sadly, not at all. We work better at home: Why? Here’s something else which happens: I hear it constantly, with people feeling it’s okay. I dare you: In your next staff meeting or team huddle, ask your people how much work they are still doing at home because it’s tougher, or takes longer to do it in the workplace itself and on the clock. Ouch. Then ask them how often they eat at their desks, or while at the fast food place parking lot, or skip lunch altogether because you don’t have a lunch room for healthy brown-bagging, where they can dish with each other about their ideas instead, feeding body and mind, AND spirit, and talking about how they Live with Aloha. It’s March 11th. Kick out the weekends, and we’ve had about fifty work days this year. We’ve had enough probationary time for some quick decisions. Start your spring cleaning early, and get more aggressive about it than you’ve ever been before. Have your rule of thumb be: “If we haven’t used it in 2010, we’re not gonna, and it’s outta here.” including holiday stuff —buy it new this year, and help our economy: Set a new revenue goal for the better work you’ll be doing so you can afford it. Donate what others can use, and throw out the rest, and stop thumbing your nose at occasional items you’re better off renting those rare times you need them. Give your people new tools, and better software. Give them room to talk to each other, huddle, and create. Do vibrant, dynamic, remarkably exciting legacy work! Create space for energy to build, and it will. Remember our energy mantra? Most office environments aren’t designed for that right now: They are proliferating maintenance-type busywork instead of the work which is connected to accomplished behaviors. Twenty, thirty, fifty or a hundred years from now, your collection of office and workshop antiques will not be your legacy. Or will it? Each Thursday I write a management posting for Say “Alaka‘i” at Hawai‘i’s newspaper The Honolulu Advertiser. If this is the first you have caught sight of my Say “Alaka‘i” tagline, you can learn more on this Talking Story page: About Say “Alaka‘i”.